At the first Smart China Expo held on August 23, Alibaba Cloud, a business unit of Alibaba Group, signed an agreement with Chongqing's Yongchuan district for the establishment of Alibaba Cloud artificial Intelligence Global delivery Center. With an investment of 520 million yuan, the center will be located at 799 Heshun Avenue in Yongchuan district. A groundbreaking ceremony will take place in October and the center is expected to begin operation in November. The project includes the construction of Chongqing (Yongchuan) artificial intelligence innovation center, Chongqing (Yongchuan) artificial intelligence global delivery center and a personnel training base. 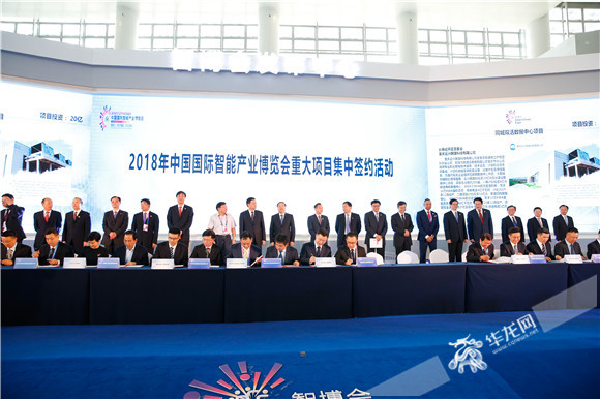 As a demonstration zone of a service outsourcing base in China, the key region for Chongqing's software and service outsourcing development, as well as Chongqing's BPO industrial base, Yongchuan district will build Chongqing (Yongchuan) artificial intelligence global delivery center based on Alibaba Cloud computing company's technology and platform, setting up a transaction subplatform, an artificial intelligent manufacturing platform and talent development and service platform. The platforms are expected to launch within 2018. By the end of 2019, the transaction platform will be able to complete import transaction volume not less than 100 million yuan. The AI industry output value is no less than 100 million and tax revenue is no less than 6 million, offering job opportunities for more than 2000 people. "Yongchuan is a famous city for vocational education. The Alibaba Cloud artificial intelligence personnel training center will rely on the teaching and training resources of Alibaba Cloud University and Yongchuan’s advantage in vocational education, aiming to build Chongqing as a demonstration city of the Internet of things and as a national-level pilot zone for big data and smart industry," said Chen Bin, VP of Alibaba Cloud computing company. In addition, college students and past graduates in Yongchuan District will be able to receive on-line and off-line training in big data and A . By the end of 2019, 200 middle and senior management staff and 1800 professionals are expected to be trained. Established in 2008, Alibaba Cloud computing company has R&D centers and operational institutions in Hangzhou, Beijing and Silicon Valley. Alibaba Cloud aims to be the top platform for internet data sharing and to become a data-centred cloud computing service company. In the future network, cloud computing will become a public service available at any time or place as needed. Alibaba Cloud provides an open platform for cloud computing. It will provide a comprehensive suite of global cloud computing services to help power and grow businesses. With the help of technological innovation, the company hopes to continuously improve its computing capacity and economies of scale, and to turn cloud computing into a real public service.